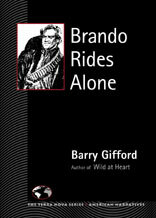 In Brando Rides Alone, poet, novelist, and screenwriter Barry Gifford sets his sights on Marlon Brando’s directorial debut, One-Eyed Jacks (1961). Marlon Brando and Karl Malden fill the boots of Rio (“The Kid”) and Dad Longworth in what reviewers dubbed “one of the first anti-hero Westerns.” Real cowboys, ageing starlets, and a twenty-nine-year-old Stanley Kubrick complement the film’s Technicolor cast of characters. Critics strung up the movie upon its release, lambasting Brando’s breezy bandit hero and lack of directorial experience, as well as the movie’s violent content and melodramatic characters. Gifford offers an alternative to the critics’ condescending analysis, dismissing any distinction between high and low art. He praises the film’s diverse cast, beautiful coastal scenery, and epic proportions. Gifford concludes with scenes from his original western screenplay, Black Sun Rising (co-written with Sam Peckinpah crony James Hamilton), incorporating cinematic elements reminiscent of Vera Cruz, The Wild Bunch, and yes, One-Eyed Jacks.